Cayo Costa (Spanish for 'small coastal island') is an island gem that takes you back to the real Florida of 100 years ago. It is approximately nine miles long and about 1 mile wide, consisting of beautiful beaches, pine forests, oak-palm hammocks and mangrove swamps. 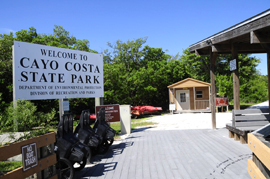 This barrier island park is a Gulf Coast paradise accessible only by private boat or tour boat. 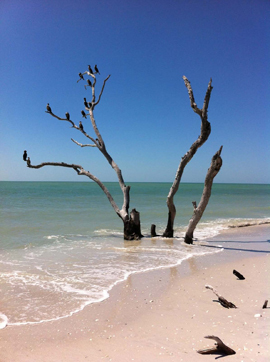 Visitors may see manatees and pods of dolphins in the waters around the 2,426 acre park as well as a spectacular assortment of birds. Visitors to the island can swim or snorkel in the surf, picnic in the shade or enjoy the sun. 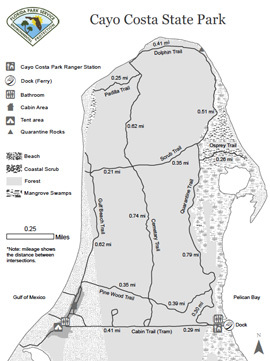 The nature trails that crisscross the island provide opportunities for hiking and off-road bicycling. Saltwater anglers can fish from their boats or throw a line out into the surf. The entrance fee is $2.00 per person (children 6 and under are free). The rustic one-room cabins offer a change of pace from the hustle and bustle of modern living. Here you can spend the day on the beach and the evening gazing at the stars with a view unobstructed by artificial lights. 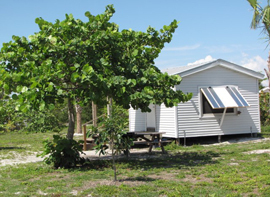 Cabins are located near the beach and nature trails. Each cabin sleeps up to six people and is furnished with three bunk beds and a table. Though the cabins have no electricity or water, outdoor grills are provided for cooking. Restrooms, cold water showers and potable water are located in the campground. Several tour boat services provide access to the island park. Visitors must carry in all food and drinks. All items must be taken off the island upon departure. Pets are not permitted in cabins and must be kept on leashes at all times. Firewood, ice, other emergency supplies, as well as fun souvenirs are available for purchase from the park gift shop. Hours are 9:00 a.m. to 3:00 p.m. Kayaks and bicycles are also available for rental. For more information email Holly Burke: hburkebips@gmail.com. Reservations may be made up to 11 months in advance through ReserveAmerica.com or call (800) 326-3521 (8:00 a.m. to 8:00 p.m. EST) or TDD (888)433-0287. $2.00 per person. Please use the honor box to pay fees. Correct change is required. $22.00 per night, plus tax. $40.00 per night, includes sales tax and bed tax. $90.00 per night, plus 6% sales tax and 5% bed tax. Jug Creek Cabins are located in Bokeelia on Pine Island. Please call Tropic Star of Pine Island at (239) 283-0015 for reservation information. $20.00 per night per vessel.